Have you seen the latest news about the Chevy Impala? Drivers are raving about the large car that has been ranked in the top five by US News & World Report. The sedan got high marks in reliability, interior features, and safety. That’s mostly because of its robust tech package that includes a lot of features in the standard edition. 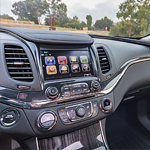 This means that you can get an 8-inch LCD touch screen, Android Auto, Apple CarPlay, Bluetooth, push-button start, proximity key entry, and six-speaker audio in the base edition of the Impala. It's one thing to get excited about a new midsized pickup truck to get you around town to do the things you need to do. It's quite another thing when that new truck is also a brand new model that's hitting the market place. When you arrive at Nissani Bros. Auto Mall, that is just what you will find in the new 2020 Jeep Gladiator. The Dodge Charger is a well-known and popular sports and performance car. The Charger and its line of vehicles have been thrilling drivers with their elite levels of power and performance for many years. While it is certainly true that the Dodge Charger kicks out power that makes it the best in class leader in its peer group, it also supplies plenty of braking force on the other end of things. What is the Chevrolet Traverse? The Traverse is the newest mid-sized Crossover SUV offered by Chevrolet. First seen in 2009, the Traverse has moved up in prominence to take command of the same market niche as the Chevrolet Blazer. Built for a new generation of drivers, the Traverse has a sleek look that belies its capabilities. The Traverse seats up to eight occupants comfortably and has a cargo carrying capacity of up to 98.2 cubic feet. The engine has monster potential, generating up to 310-horsepower. The sleek look of the sculpted design draws the eye even while at rest. Vehicles, such as the new Chevrolet Silverado 1500 pickup, are typically looked up for their utilitarian nature. That is to be expected because it is built to get work done. That does mean, however, that it doesn't also have a few technology features that make driving around town a bit more pleasant. Once you arrive at Nissani Bros. Auto Mall and step inside, you will find a few things to appreciate about the new Silverado. Just behind the steering wheel, you can choose to have a 15-inch diagonal multicolor heads up display. When you are looking for a full-size SUV, you want to find something that offers you a number of features and that will keep your whole family happy. The Chevrolet Tahoe is a popular choice and a vehicle that is outfitted with the technology features that you are seeking. You are looking for a large SUV that is designed well. You want to find a vehicle that will not only give you the space that you need but that will impress you with the way that it was designed and created. The popular Suburban is a large Chevrolet SUV that has a design worth noticing. Every driver looks for something different when car shopping. What appeals to you most? Is it design, performance, safety, technology or exterior features? The Chrysler 300, a popular full-size luxury sedan, offers all these things and more. At Nissani Bros. Auto Mall, we want you to well-informed when you buy a car, so we’re here to answer all your questions. With the adaptive, automatic-leveling capabilities, the high-intensity headlamps do more than just provide light. They monitor the vehicle speed and steering angle and give you more light when needed. First introduced to the automotive market in the early 80s as a two-door pickup truck, the Ram 2500 has evolved into a powerful workhorse. These days, it's a popular heavy-duty pickup truck among customers who need to tow heavy loads, whether it be a trailer, boat or loads of dirt. Customers shopping for a Ram 2500 can choose from three engines. Two of the most popular are the proven and legendary 6.7L Cummins turbo diesel I6 engine. It provides up to 370 horsepower and an impressive 800 lb.-ft. of torque. Are you searching for a different kind of vehicle, one with a unique look and a good number of extra features to keep you happy on the road? If so, you should take a little time to learn more about the Hyundai Veloster and all that this popular coupe has to offer. Is having a large touchscreen in your vehicle something that is important to you? If so, you will be happy to know that the Veloster gives you the option to set your vehicle up with an 8-inch touchscreen that you can use for infotainment purposes.